Joy is everyone’s true nature, when we forget it and run after wordly power we create pain and suffering not only for ourselves, but also for every living being on the planet, both on the earth and in the ocean. Many myths speak of whales as ancient symbols of creation and originators of life on earth. To the ancient Greeks the Dolphin was a sacred messenger of the gods, and to Christians, a symbol of salvation. Thousands of people down the ages have been enchanted by the magical and mystical healing powers and compassion of our sisters and brothers in the ocean. Many have experienced their gentle, wise, and playful nature, which they generously and unconditionally share with humans everywhere, regardless of even when humans place them into man-made concrete pools and use them to entertain and perform, or trap and kill them in nets to feed their bellies. Dolphins and whales teach us about purity, authenticity, and true sharing. They don’t create weapons of mass destruction, don’t kill to dominate, and don’t seek riches, accumulate possessions, or dig for gold. They don’t judge and manipulate to have their needs met, and don’t capture other living creatures to become their rulers. They don’t make display of their power, proclaim religious righteousness or fight for territorial security. Like all the enlightened beings who have and are living on this planet, dolphins and whales, whether we are aware of it or not, have been vital in helping humanity in their evolution to greater consciousness. These creatures have helped to heal, teach, and transform more human lives than any politician or a priest. We can learn much more from them if we learn to hear their language, honor their environment, and treat them with love and respect. As someone who has experienced their unconditional love and communicated with them, I would like to share a few personal stories that speak loud and clear about their wisdom, intelligence, and compassion. 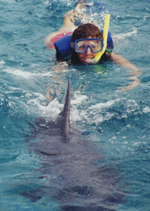 My first experience of being with dolphins was in Mexico in 2003 when I was vacationing in Tulum. The weather was cold and stormy, and I felt like a prisoner in my own body. I was lifeless and energetically depleted. Sitting on the beach in the full moon night, I asked existence for help. An instantaneous thought entered my mind that I should swim with dolphins. I always felt love for them, but never a pull to be with them until that moment. A warm cuddly feeling suddenly came over me, as though I was going home to meet my long lost family. The next morning, not knowing what to expect, I was on my way to Xel•Ha Dolphin World on the Mayan Riviera. They had large manicured grounds with several ‘attractions’ along the ocean bank. I was surprised to see the dolphins in a pool. I felt excited to see them, yet sad at the same time. To see them in a small confined area where they were forced to live was depressing. After the orientation meeting a group of us marched towards the pool. I had no idea that I was walking into a circus to be entertained. 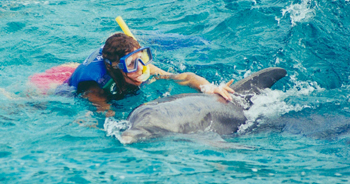 Part of the performance was taking photos with the dolphins, riding on their bellies while holding on to their flippers, or riding standing on their backs. I felt too tired and uninterested to follow the fast paced performance. All I wanted was to swim and connect with the dolphins. Everything seemed controlled and artificial. The only few moments of simply being with the dolphin was during the photo session. Just touching and kissing the dolphin was heart warming and life changing! Below are two photos from this day where you may notice how tired I was, but at the same time happy for having a few magical moments of heart-to-heart connection. I do not recall the dolphin’s name, but it was a young dolphin, born in captivity. I felt she was also happy to be with me. Though the few moments with the young dolphin felt extremely poignant and tender, they were too short and controlled. I felt as captive in the concrete walls as she was and felt like a puppet following the trainer’s instructions without a choice. Feeling the need to be with the dolphins in their natural environment – the ocean, the next day we drove to Playa del Carmen to make our way to the Gozumel island where one could swim with dolphins in an ocean pen. Though the dolphins there were still in captivity, they had a much larger area to swim in without the enclosure of cement walls. Fenced around a rocky shoreline, they could feel the natural tides of the ocean and see the occasional fish swim in with the tides. This place somehow felt more humane, and the dolphins did not have to perform other than just swim with us and have a few jumps at the end. There were eight of us with a dolphin named Capi. I believe he was captured in Cuban waters. The trainer dove with his scuba gear into the ocean floor in the center of the pen and instructed us to stay in a circle above him while he motioned the dolphin to swim around us. To my surprise, as Capi began making his circles in the water, he repeatedly swam straight at me sending a high pitch sonar sound each time he approached me. I knew that he could feel that I was energetically depleted, and kept sending me his love and energy through his sonar. With each sonar I felt a surge of energy in my body and a sense of overwhelming joy each time he swam towards me. It felt like Capi was charging my life force bit by bit. He would also slow down to allow me to touch him as he swam by. My cense of time and place had disappeared and I suddenly found myself near the stairs, away from the group. Although there was no one around, Capi still kept coming and sending his sonar. Then, I saw the trainer almost underneath me motioning me to get back into the group. He seemed upset that he was loosing control over the situation and the dolphin was spending too much time with me. I thought perhaps this is one of the reasons why the dolphins were kept in small pools and allowed to swim with people only for a very short time. Depriving them of their senses and making them dependant on survival is the only way to control their spontaneous behaviour. Isn’t this also how we control our fellow humans? 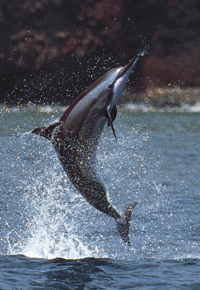 In the open ocean, the dolphins behave with their own intelligence and senses. Perhaps for just a few moments Capi forgot that he was in captivity and his natural instinct to help kicked in. It was amazing to see people’s faces after the swim. Everyone looked more vibrant and open, and somehow, more silent and content. It was also amazing how my whole body felt stronger and more energized. Capi had given me part of himself absolutely unconditionally! With just one more day left before our departure from Mexico, I could not think of a better way to spend the day than to return to see Capi for one last time and express my gratitude. I was now feeling much stronger, and looked forward to have my picture taken with him. I dedicate this page to Capi. The experience with Capi no doubt left me with a longing to be with the dolphins in the wild. A year later, I joined a dolphin retreat with one of my friends and students Kim Roth on the Big Island of Hawaii. The house we stayed in was the last house on the tip of the Kaelakekua bay where the spinner dolphins like to spend their day playing and having a fiesta after their night’s feeding. Below is a diary of magical five days I was privileged to spend with spinner dolphins in the Bay. Perhaps reading this diary might light a spark in your heart and give you the kind of sonar energy boost like the one Capi gave to me. A man, waiting on the beach for the spinners to arrive from their night’s feeding hunt, signaled their arrival by blowing his horn at 7:30 am. I looked up from my bed and saw the dolphins already in the bay, playfully jumping and spinning in the cool air. The bay was in the shadow of the small mountain range surrounding it with the rising sun still hiding behind it. By the time we got into the bay in the house kayak, there were already many swimmers and several people on kayaks trying to catch up with the dolphins as they kept moving from place to place, seemingly playing hide and seek with them. We decided to jump into the water and join the game, but soon realized that there was no way to catch up with them. I was not interested in the chase, and decided to just enjoy the morning swim and see what happens. Looking down to the vividly visible sandy ocean floor I could see few fishes passing by, and the sparkling diamonds of sunrays playing in the water and in the sand. It was a euphoric feeling. One could sense a gentle joining of the earth and the sky. I felt I was floating in between two realities, as if being lifted into another dimension. I forgot all about the dolphins and began enjoying letting go into the feeling of weightlessness and buoyancy. Then, I suddenly saw a dolphin swimming towards me. He circled around me, as if checking me out, and swam away. Almost a minute later, several other dolphins appeared directly underneath me, and then more started coming. I was soon surrounded by perhaps 25 dolphins. I knew that I had passed the test and was accepted into the pod. They knew they were safe and would be respected. They swam all around me, diving into the bottom of the ocean floor then gracefully rising for a breath of air. Sometimes they swam fast, at times slow. Sometimes they were playful and other times just floated near the ocean floor. It seemed that they were resting for few minutes before needing to come back for breath again. I later learned that this was how they would have their daily sleep. I tried to swim with them and noticed a big leaf floating in the water. One of the dolphins nudged the leaf to me with his nose but I couldn’t catch it. I was unable to dive to its depth. I felt they were inviting me to join in their play, but I couldn’t manage to swim fast and gave up. They sensed that I was not a very good swimmer and obliged me by swimming around me in a circle instead. I was just enjoying watching them play and interact with each other as they criss-crossed their bodies in a gentle caress. There were also several babies with their moms and accompanying aunties, who swam slower than the rest of the pod, and at times a large fish would also join the mom’s tale feeling the nourishing safety of her maternal instinct. After some time, several swimmers caught up with their new location and tried to dive in closer to them. To my surprise, all the dolphins suddenly disappeared. I continued enjoying the sunrays once again, and few minutes later they re-appeared again, once they had lured the swimmers to a different location. When the same thing happened again several times, I thought that it was a clear indication that they did not like aggressive swimmers when they were on their siesta and needed to rest. After about two hours, I started to feel cold and it was time to get out of the water. I was filled with so much wonder, love, and joy that I thought if I don’t get to swim with them the next day, I was utterly fulfilled. The dolphins entered the bay at around 7 am. When I got up and went out to the terrace for breakfast, about five or six dolphins began swimming towards the house. Kim and I watched in amazement as they came closer and closer to the house. I felt they were calling us to join them, and telepathically said that I got their message and that we will be joining them soon. They heard me and turned around to swim back into the bay. As we paddled our kayak into the bay, several dolphins, perhaps the same ones who had come to fetch us, greeted us half way. As we got into the water, they gathered around us and started making bubbles in the water. This time, we were surrounded by maybe 75 or 100 dolphins of all ages and lots and lots of bubbles. I felt they were happy and laughing. A laughter also bubbled up inside me and when I smiled, the water started coming into my snorkeling mask, so I had to contain the laughter inside. We played with them for quite some time, and I left like I was a part of their loving family. These gentle creatures gave me a gift that penetrated deep into my core like none I had received from any human with the exception of Osho. The spinners showed up at about 7:10 am, and as in the previous days, the man on the beach blew his horn to let everyone in the area know that they had arrived. The air and water were cool and not so inviting in the morning, and there were only a few swimmers in the bay. We stayed in the house watching them play as they jumped and spun in the air. Today, I decided to take my underwater disposable camera, hopping to get some photos of the dolphins. However, I soon realized that it was difficult, because they would swim faster than I was able to focus and click. To make the photo shoot easier, I asked them to pose for me. Once again, they heard me and obliged by slowing down and even coming to a stand still for few seconds so I can take my photos. The 24 shots were gone faster than I hoped. As we went back on our kayak to head home, we suddenly saw a whale in a distance. We were excited, and paddled as fast as we could to get closer. We were soon in an open ocean with a couple of whale watching boats in a close proximity. When I looked back towards the bay I was shocked how far we had paddled from the shore, and decided it would be better to just wait and see what happens. Not long afterwards, the whale jumped out of the water just in front of our kayak. We were speechless. It felt like a moment of magic. He was massive! He went around us a few more times and then was gone. When we decided to paddle back, we saw him again in a distance. His body was floating motionless above the water. It seemed he was sleeping. We paddled closer and stopped, but then someone from a close by kayak jumped into the water and the whale was gone. We returned to the bay and decided to swim with the dolphins one more time before returning home. There was a coast guard boat in the bay. When in the water, I felt the dolphins were disturbed. They were swimming in a circle around the boat, sending squeaking sonar sounds that clearly indicated their displeasure. We went home in silence with mixed feelings about everything that had happened. Dolphins were very playful today. They sonared each other as they played and mated. It was so much fun to just watch them interact with each other. I could see their different personalities, and thought that they were not different from humans. The only difference was that they lived in the ocean and we live on land. There were a couple of aggressive swimmers in the bay today, and dolphins kept avoiding them. When these swimmers would suddenly dive into their midst, the dolphins would quickly disappear into the ocean floor or just swim away. I guess the divers didn’t know that you need to wait to be invited. We were slow this morning. We sat on the verandah watching the dolphins for awhile. I noticed they kept moving away from people. It seemed they wanted to be left alone. By about 10:00 am their mood changed and it was now OK to join them. We decided to swim in from the beach. On the way to the beach a man stopped us and we started talking. He told us that when dolphins go into the deep ocean to feed at night they often get attacked by sharks. The spinners always swim together in groups of three or four. They come up for air together and dive back down in unison. They need to stay close so they can protect each other from shark attacks. When we got into the water, I saw at least a dozen dolphins with shark wounds. 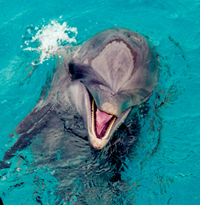 One dolphin in particular was severely wounded on both sides of her body. It looked like her body was scraped open with a saw. My heart sank when I saw her. I called her to come near so I can send her some healing energy. She quickly swam towards me. As the rest of the pod circled around us, the dolphin stood floating motionless beneath me. I began sending her healing energy through my hands and heart. After a few minutes, when I noticed other wounded dolphins, I sent them a message that whoever else needed healing they can come and join the dolphin who was in the center. Another dolphin approached and stood motionless next to the first one. He had two big holes on the side of his body, and his skin looked swollen around the wounds. Many other dolphins circling around us were also wounded, but their wounds looked less severe. It was obvious that they knew who had the worst wounds and gave them priority for the healing session. After about 15 – 20 minutes staying motionless in the water I began feeling cold. The moment I thought I was cold, both of my dolphin patients gently swam away and joined the pod. I swam a little to move my body and get warmed up. Then, the badly wounded dolphin came back to continue the healing session. When I needed to move again, I stuck my head out of the water and saw a commotion going on in a distance. There was a whale in the bay! He appeared and disappeared among swimmers and kayaks. I saw his tale in the air fliping back and forth as though entertaining everyone. I heared his breath as he surfaced for air. I thought to swim towards the whale but knew I will not be able to catch up with him the way he was moving around from place to place. Several dolphins swam in front of me and tried to lead me to the whale. I followed them, but soon had to stop. It was impossible to catch up with their speed. I thanked them for trying to lead me towards the whale and said that I could never swim as fast as they do. I asked them to bring the whale to me instead. When after a few minutes I saw the whale swimming toward me on a head on collision course I was shocked. They brought the whale! He approached very rapidly, but I had no fear that we would colide. I knew he will be gentle. As he came closer, he slowed down to almost a standstill and turned to swim sideways. He was now only four or five feet away. Seeing the enormity of his size was breathtaking. It was as if time had suddenly stopped. I tried to find his eye among the many barnacles as he slowly and gracefully swam in front of me. He looked into my eyes as a wise and loving Buddha. Although he was in the ocean and part of the earth, he seemed to have come from another planet, and just like me, he was only visiting here. I asked him what his message was for humanity and he said, “Love.” Then, he turned around and disappeared just as quickly as he had appeared. I felt this was our first meeting among many to follow in due time. A thirty-five foot surf approached the Big Island from Owahu. The surf got bigger and bigger, and no swimmers or dolphins came into the bay. We spent four more days on the Big Island, visiting the old volcano craters, which are still alive and steaming, and basked in the sun untouched by the waves like a couple of turtles. I had missed seeing my most precious ocean friends, and while on a vacation in Mexico decided to visit the local “Dolphinarium” (hate using this word) – a large swimming pool, that housed many dolphins, both young and old. Some were captured from the wild and some born in captivity. When we were waiting for our turn to be taken to the pool, Albert pulled me aside and asked me to follow him. We were suddenly right by the pool with no human on site. I was so excited to see the dolphins again that I naturally walked toward the edge of the pool. Simultaneously, three mature dolphins, as though waiting for me, came to the edge of the pool and began greeting me with their laughter and mouths wide open. I felt that we were very old friends meeting again in great love and joy. As I reached out to touch one of them, I heard the trainer shout at me from across the pool to move back. As I followed his angry command and moved away from the pool, one of the dolphins jumped out of water and landed right by my feet on the cement floor. As I tried to lean down to touch him/her again, the trainer yelled even harder. As I moved further away, the dolphin jumped back into the pool, but to my astonishment jumped out again, this time even further out, with his whole body fully on the cement floor.